The North Downs way is a long distance footpath through Surrey to the Kent Coast at Dover. It is 156 miles long, including a loop via Canterbury at the eastern end. The path runs along the chalk ridge of the North Downs and despite going through one of the most built up parts of Britain, it still takes in plenty of quiet open and beautiful countryside. The path was opened in 1978, making 2005 the 27th year of it's existence. Almost all of the walk is within easy access of London and has good transport links. On this site I have split this walk down into easily managable stages and included transport options back to the start of the walk, making it easy to walk the path in day stages. 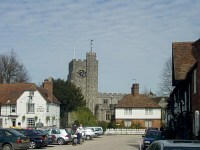 This walk is the start of the North Downs Way and begins in the pleasant town of Farnham in Surrey. It follows the banks of the river Wey for a while before heading through woodland and into open fields, giving views of the Hogs Back. The walk continues around the north edge of Puttenham Common before coming into the pretty village of Puttenham. 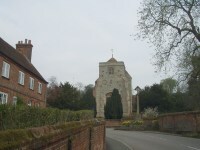 From Puttenham it goes through part of the Losely Estate and onto the banks of the river Wey to the south of Guildford. From here it is a short walk along the South Wey Path into the centre of Guildford. This walk begins in the town of Guildford with it's attractive High Street and Castle. The walk initially follows the Wey South Path alongside the attractive River Wey, to the point where it joins the North Downs Way. 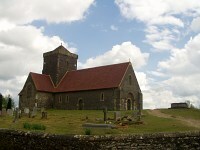 The North Downs Way then climbs to the beautiful St Martha's Hill and St Martha's Church, from where there are excellent views to the South. The path continues past the famous beauty sport of Newlands Corner and then continues through Woodland to Hackhurst Downs where there is a path into the pretty village of Gomshall. This walk begins in the pretty village of Gomshall, a short walk from the North Downs Way at Hackhurst Downs. From Hackhurst Downs, The North Downs Way passes through beautiful woodland, with excellent views over the hills towards the South Downs before coming to the church of St Barnabas at Ranmore Common. The path continues through the famous Denbies Wine Estate before joining the A24 to the pretty village of Westhumble, in the shadow of Box Hill. This walk starts from the bottom of Box Hill near the village of Westhumble. After crossing the river Mole the path climbs to the summit of the famous beauty spot of Box Hill. 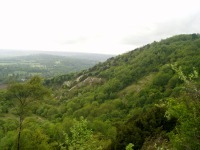 From here there are views towards Dorking and Reigate. From Box Hill the path rounds several old (and one active) quarry before again climbing Juniper Hill, Colley Hill and Reigate hill, where there are again excellent views over Reigate and Redhill. From Reigate Hill the path descends and passes through the grounds of a school and golf course before arriving in the centre of the small town of Merstham. This walk begins in the small town of Merstham, to the north of Redhill. After a brief walk through residential streets, the path crosses the M25 and M23 then climbs back through fields onto the Downs, from where the are excellent views. The path continues through some trees coming out onto Caterham viewpoint, then pases next to a Vineyard and through woodland before descending round the edge of Tandridge Hill. After a brief climb round Tandridge Hill there is a descent towards the railway line and then a steeeper descent round a quarry from where it's then residential walking into Oxted. This walk sees the North Downs Way cross the M20 and turn to the north, towards the Medway Towns. The path climbs back onto the chalk downs, offering excellent views along much of the length of this walk before heading towards the River Medway to Cuxton. This walk begins in the small village of Cuxton and then crosses the spectacular Medway Bridge (that carries the M2 and Channel Tunnel Rail Link), over the river Medeay near Strood. The path climbs away from Medway Bridge, giving good views of the river and Rochester in the distance as it heads south towards Kits Coty and the burial chamber, thought to date from 2000BC. This is followed by a steep climb back up onto the downs and then a steep descent into the pretty village of Boxley, the end point of this walk. This walk starts from the attractive village of Hollingbourne where the path rapidly climbs to give stunning views over the downs. The path continues at a high-level through open countryside for the first few miles with fantastic views the whole way. After a few miles you pass the remains of Thurnham Castle before the path descends into Detling. A new crossing takes you over the A249 and back onto the downs. This last part of the path is mostly through the edge of a wood before a steep descent into the attractive village of Boxley. 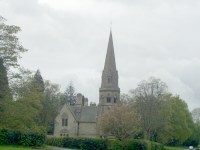 This walk starts from the small village of Hollingbourne near Leeds Castle. After a brief climb out of Hollingbourne the path remains at a high level through open countryside for the first few miles, passing close to the villages of Harrietsham and Lenham. There is a small war memorial cut into the downs near Lenham, a reminder of times past, before the path briefly joins a road round an old quarry and then on towards the pretty village of Charing, the end of this walk. This walk begins in the attractive village of Charing. 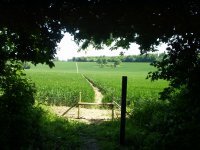 The path climbs out of Charing, giving good views over the surrounding fields and back towards the village before heading through the edge of some woodland. It then comes into open countryside, past Eastwell Park and to the small village of Boughton Lees, where the path divides. Continuing on the path towards Folkestone and Dover, this walk ends in the small town of Wye. 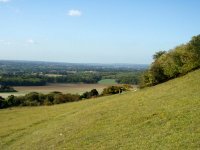 The rural town of Wye is the start point for this walk, which follows the North Downs Way through stunning scenery towards the coast. After the climb out of Wye, passing Wye crown, the path remains near the top of the downs for most of this walk, passing the spectacular Devils Kneading Trough and the village of Stowting. The coast is visible for much of this walk, a reminder that the end of the path is now not far away. 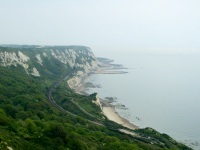 Reaching the coast and the beautiful White Cliffs of Dover is a fitting end to the North Downs Way. From Etchinghill you're soon towering over the busy Channel Tunnel Terminal and the town of Folkestone below. Soon the path reaches the coast and the North Downs Way follows the cliff top along the white cliffs all the way to the busy port of Dover, the end of the North Downs Way and a satisfying way to end. The only way to continue south east from here is to cross the channel to Calais, the cliffs of which are often visible from Dover. 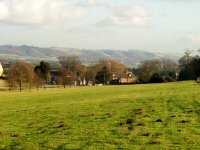 The rural town of Wye is the start point for this walk, which follows the North Downs Way back towards Boughton Lees, then takes the northern route of the path to Canterbury. The path pases through woodland, into the beautiful town of Chilham. From Chilham, the path climbs into Old Wives Lees then on through the edge of Chartham into the magnificent city of Canterbury, with its' cathedral dominating the skyline. 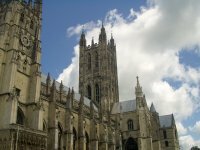 This walk starts in the beautiful and historic cathedral city of Canterbury. The path heads through the city centre and through the east of the city, climbing back onto the downs. The path pases through the village of Patrixbourne and continues through large fields of crops, passing through the villages of Womenswold and Woolage on the way, before arriving at the small town of Shepherdswell. This part of the path is slightly different in character from most other parts of the path since it spends much of the time going through open fields rather than woodland. From Shepherdswell it passes Waldershare House then goes through the villages of Ashley and Pineham before descending down to Dover passing through the town to the market square, marking the end of the Canterbury part of the North Downs Way. Guides to the paths, maps, travel information, equipment etc.